For weeks now, I can't get a song out of my head. It's a song from my past and I haven't heard it for thirty years, at least not until the other day when I finally looked it up and listened to it on Spotify. 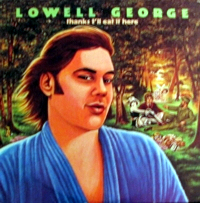 The song is called Twenty Million Things from the late Lowell George's (lead singer from Little Feat) solo album. I loved the melancholic haunting quality of his sweet, sad voice. His song, Twenty Million Things, could have been my anthem and still could be. From a meditator's perspective: thoughts don't pop into one's head for no reason. There's some message or some connection to what lies beneath the surface. It is a connection to the obviousness of the universe which is never obvious before the point in time when it becomes, well, obvious. The connection between all things, sometimes fragile, often tenuous, lies beneath the surface of the twenty million things on a to-do list. So,why this song now? The song plays over and over in my head, when I'm walking the dog, driving around on errands, trying to get work done. My to-do list torments and taunts, but not more than usual.Still, when I first began to meditate, I cleaned out several drawers and around all the objects in the drawers, I created a beautiful blank space. I thought the impulse to declutter was a new part of my persona. I thought I owned it. I'm still meditating, but the mess is back. My desk is piled high, my drawers are stuffed, the counters in the kitchen are a halfway house for objects I can't seem to throw away. I don't know if the strains of the melody in my head are related to my dissatisfaction with the disorganization that is my life, or if there is some other connection. Perhaps a connection to the time of my life when I used to listen to this album. Or is it something more obvious than is apparent to me? The song is speaking to me and all I can do is try to hear it.